During the era following the Second World War world peace was largely assured through American-European cooperation on the political, military, and economic level. 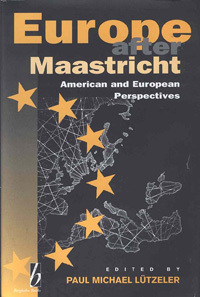 This status quo was upset by the ratification of the Treaty on the European Union (Maastricht Treaty) which will, whatever obstacles still remain, inevitably lead to closer cooperation among (west)European countries and to a shift in Europe's position within world politics. This raises a number of questions that are discussed in this volume by an international team of experts from Europe (east and west), Russia and the United States. Paul Michael Lützeler is Rosa May Distinguished University Professor in the Humanities at Washington University of St. Louis; Director of the European Studies Program; Director of the Center for Contemporary German Literature and Chairman of the Senate Council. Chapter 7. Monetary Union in Europe: End of a Dream or Beginning of a Nightmare? Chapter 14. Environmental Policy in Europe: The Greening of Europe?